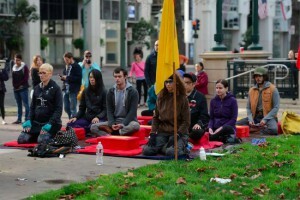 Members of the Berkeley Shambhala Center and others sitting at a recent protest in Oakland. On the cushion I sit with my breath, to learn the nature of mind, and to connect myself to all other sentient beings. May we all be free from suffering, and from the nature of suffering. I have mostly questions today, in the morning light after a day and night of protests. I listen to the news and sip my coffee, count my blessings, practice on the spot with the aspiration that confusion dawn as wisdom. The protests in Ferguson, Oakland, Berkeley, all across our land are indeed waking people up, calling the country’s attention to the present moment. But to what end? Will anything change? The Vietnam war protests did effect change; Black Panthers, too; MLK Jr got our attention and moved society in a peaceful manner, even to the point that he gave his life for the cause. Is violence necessary? Do looting and harm come from an aggressive impulse and a movement with no leadership? Kick in the windows on a symbol of oppression to lighten the burden of helplessness. I practice tonglen for myself, for everyone sitting in fear, feeling powerless and scared, everyone who experiences the fear of aggression, both outside and inside themselves. I think the scariest aggression is that which lives within ourselves, and seeing it flash its pearly whites in the cave of my identity as a peaceful warrior is scary. I recently staffed a Way of Shambhala retreat, and in one of our discussion groups the question posed was simply, what do we do as Shambhalians, warriors, bodhisattvas, to support change, to support people speaking up for themselves, to ally ourselves with the forces of good? 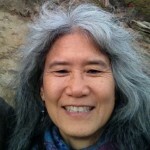 Is pacifism called for? What would Chogyam Trungpa do? Would he march? Teach? Sit? Show up at all? Our radical teacher believed in benevolent disruption. One of my favorite videos of his talks is an Independence Day retreat. The room is solemn and filled with students, awaiting their teacher take his seat. The Vidyadhara strolls to the front of the room, greets the students, and reaches over to light the incense. It’s a very serious moment, until the incense begins to light, and it turns out to be a sparkler! Rinpoche laughed and laughed, the students took a bit to catch on, but eventually they laughed too, tickled. It’s that kind of disruption, the trickster energy, that can spark(!) us back to the present moment. Fresh. What can bring our society to this present moment? Perhaps exactly what is happening now on our streets is precisely what is called for to wake the sleeping giant of complacency in our world. Perhaps. So many questions, so much confusion of my own. I don’t have any answers, and over the last few days sitting to write this post, I only get more confused when I start to slog into the mire. My fear of not being understood, or worse, of being misunderstood, rear up and threaten to mute me. Instead of insisting that these thoughts be kneaded into a manifesto, I’m sharing with you my own confusion and inviting you to contemplate your own aggression today. Today I sit with that. What can my own aggression teach me about what’s happening in our world today? Can experiencing our own aggression be the foundation for a bridge of compassion to others? I feel that it might. Thank you for reading, for caring, for extending ease to yourself, and to others who suffer today, and always. Thank you! I am so proud of the practitioners who created and participated in this event. I would like to join you! Thanks Amani for bring up this often avoided topic! And thanks Marc for posting the link to the Untraining. The Untraining offers race specific groups for whites, people of color and Chinese people to explore their social conditioning around race. It’s not our fault, we were born into a system of racism. And we can become more aware of how our conditioning is unconsciously expressed. With awareness we can stop perpetuating racism and internalized oppression. Race specific groups helps create safety for healing personal and social oppressions. I have been a part of the Untraining since 2009 and am now a facilitator for Chinese groups.